Funko Five Nights at Freddy's Mystery Minis Series 2 brings frightful delight for Sister Location with a primary format and several retail exclusives. The second installment of Funko Five Nights at Freddy's Mystery Minis features characters from 2016's FNaF: Sister Location game, as well as favorites from previous releases. 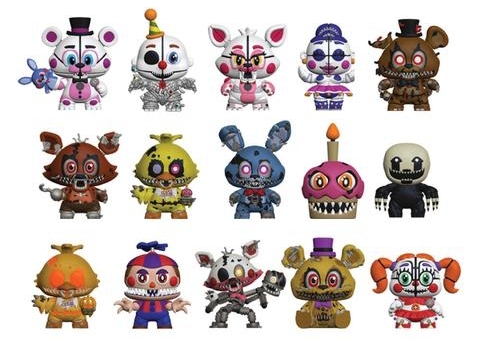 Sister Location subjects include Circus Baby, Ennard, Funtime Foxy and Funtime Freddy, while updated Nightmare versions of Balloon Boy, Bonnie, Chica, Mangle and Puppet are also included. Additionally, Funko Five Nights at Freddy's Mystery Minis Series 2 highlights every gamer's death inside FNaF. These Jumpscare figures are exclusive to Toys R Us and Walmart locations. Other exclusives include Golden Freddy, Plush Trap and Withered Bonnie minis, which are issued through GameStop. Buy Five Nights at Freddy's Mystery Minis Boxes on Amazon. Standing roughly 2 1/2" tall, Funko Five Nights at Freddy's Mystery Minis Series 2 maintains the blind-box box format. Collecting the entire set will take a bit of extra work as three separate retailers offer exclusives. This is especially true given that there are over 20 options to locate and there are only a dozen boxes per case format. Links will show any available exclusive figures once they release. Figures specific to a certain format, and known odds are noted below. Five Nights at Freddys FUNKO Mystery Mini CIRCUS BABY Vinyl Sister Location NEW! Any intel about when toys r us and walmart are supposed to release their FNAF minis exclusives? Haven’t been able to find anything online.